Prevent unexpected downtime with reliable failover protection. 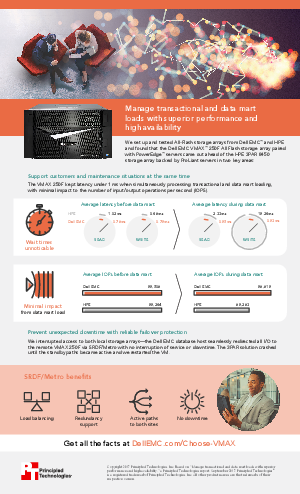 We interrupted access both local storage arrays - the Dell EMC database host seamlessly redirected all I/O to remote VMAX 250F with Intel® Xeon® Processor via SRDF/Metro with no interruption of service or downtime. The 3PAR solution crashed until the standby paths became active and we restarted the VM.